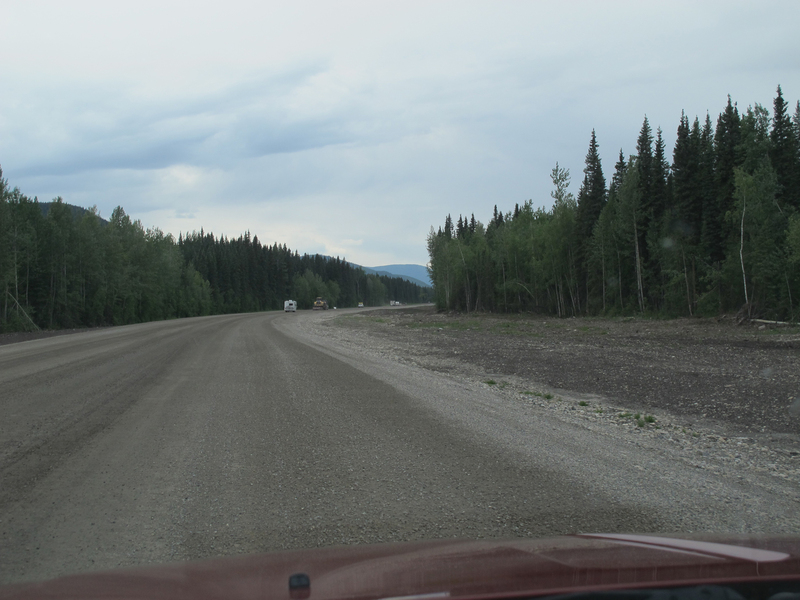 June 23 – Fort Nelson to Watson Lake – Out of British Columbia and into Yukon Territory. That’s one more for the checklist of states and provinces and territories. 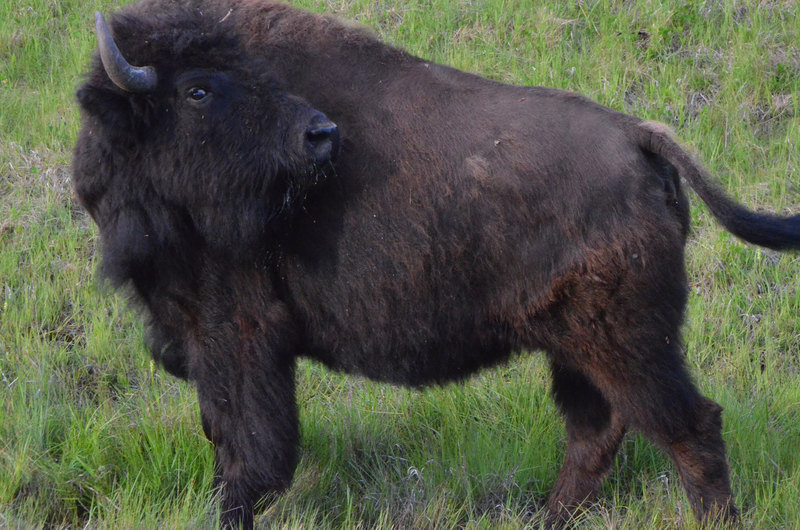 Today’s highlights include Bison, Bears, Grand Scenery and Road Construction. Under mixed weather the road heads mostly west but a little north through the Northern Rockies, following rivers and crossing between drainages. 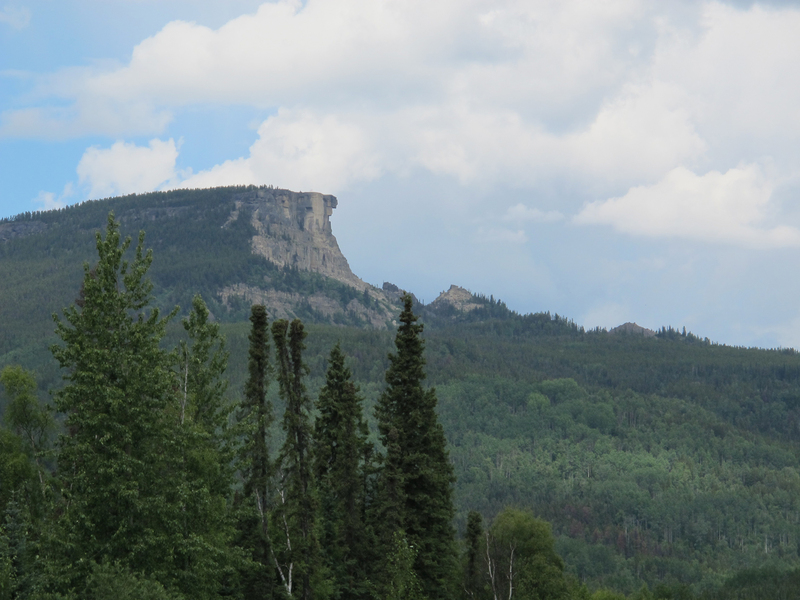 This is rugged terrain with just a few small settlements along the way. I am happy to see that the first construction I come to today is in the clean up phase. The patches are done and they are just cleaning up the excess gravel from the roadside. 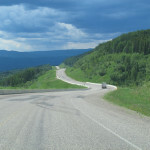 The road rises up away from the river over steamboat mountain summit and winds through taller trees, open areas give a view to nearby hills and mountains in the distance. 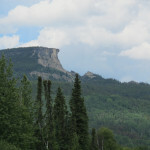 I stopped to watch a rain storm on the horizon and take a couple of pictures of Indian Head mountain. This is one of those things that I would have missed if I hadn’t read ahead in the Milepost. They say there are two seasons in the north, winter and construction. So coming across some road construction is not uncommon. Next construction zone wasn’t patching. They had the road torn up for several klicks, graded flat and graveled. It was just a little wet, so keeping my speed down and finding a more gravely track reduced the muddy mess on the car and trailer. It is a somewhat vain wish to keep your vehicle looking nice with all the construction, but I was still under the illusion that it was possible. After yesterday’s fuel issue, I filled up the two 2.5 gallon gas cans I had along. I hadn’t filled them prior because the only place I could figure to carry them was in the back to the Jeep, turns out they didn’t vent fumes at all, so it worked out better than I had hoped. Regardless, this is a pretty remote part of the trip so I also decided to stop a little more often and just pay the asking price to top off. The benefit of this was that I met a lot of nice folks and saw some local crafts that I wouldn’t have otherwise. At one of the stops the pump was really old and had cardboard covering all but the number of gallons. It apparently was not up to the task of counting liters at the $1.49 per liter rate in effect. At one place I stopped someone had apparently driven off with their breakfast on the roof. Some tasty looking french toast was poking out of a take out container. The local ravens had noticed this about the time I came to get back on the road, I saw the commotion, stopped to watch, and pulled out my camera. It looked like there were as many pieces of toast as ravens, but who knows how quickly the word will get out. So they were clearly interested in getting their loot to a safe place. Each of three ravens managed to get a piece of toast out of the container in turn, and they were attempting to fly away with the whole pieces. From this I think we can estimate the maximum lifting capacity of a full grown raven at just about one thick well coated piece of french toast. They just barely managed to get into the air. I think it must have been a good day to be a raven. 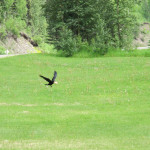 Actually I don’t have photos of this, but there are a lot of ravens that hang out near the side of the road, hopping along foraging. 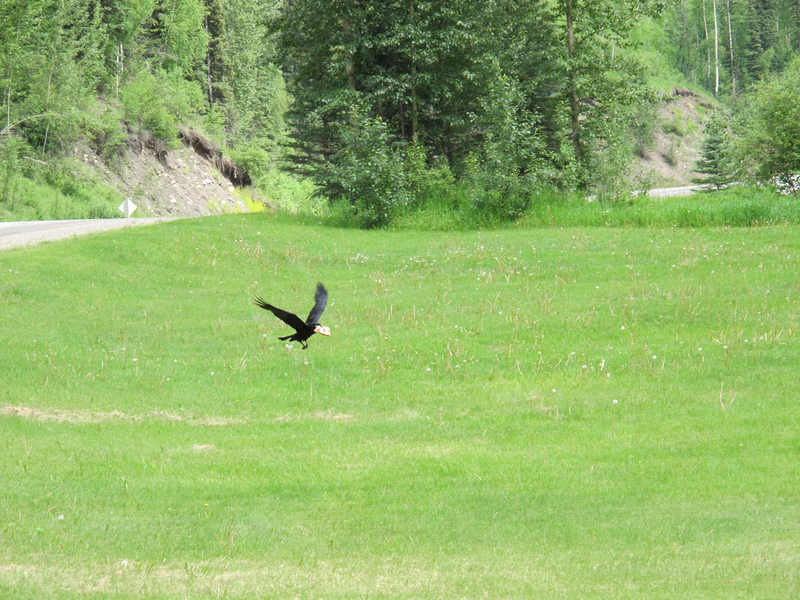 They typically fly away as the car comes, and occasionally they fly along the road ahead of the car and slowly fall back over the top to surf the updraft. 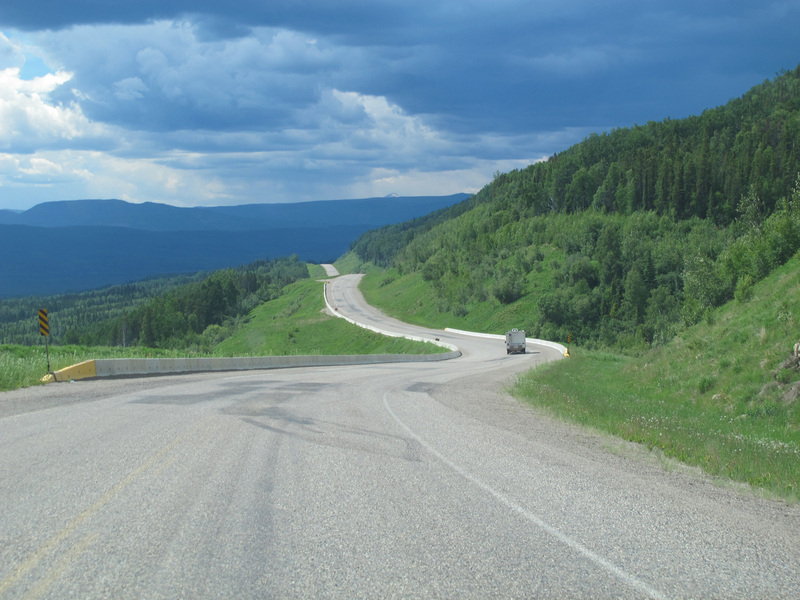 It was an entire day of driving through mountain passes, along and over rivers, past lakes small and large. And as the day wore on the wildlife sightings began. 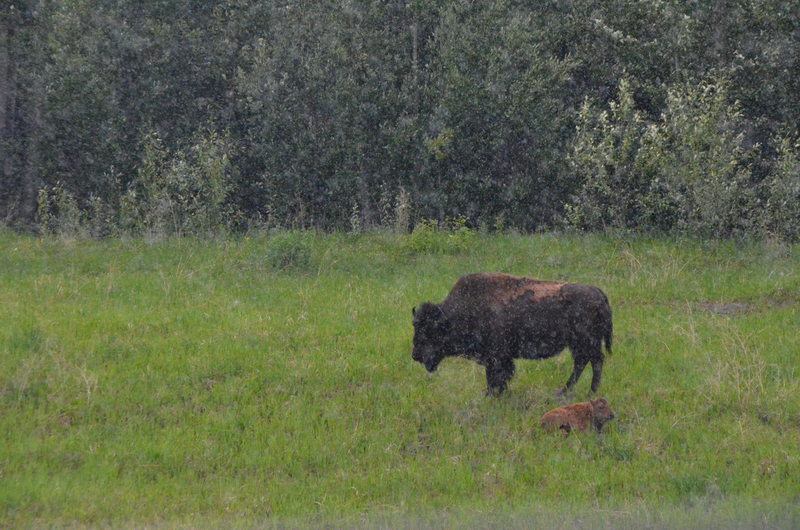 The first bison I came across was during a bit of a rain storm. They were grazing in the grass alongside the road. 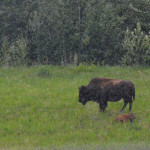 The steady rain didn’t seem to bother the furry bison too badly. Occasionally one would shake the water off, and sometimes I would see them twitch their ears at the annoyance. 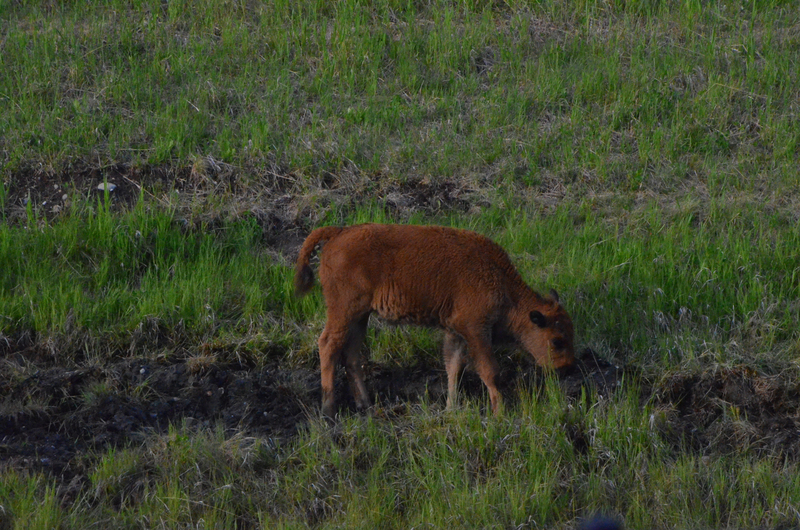 I took some photos because I wasn’t sure if I’d see more bison later. But this wasn’t the last I “herd” of bison however. 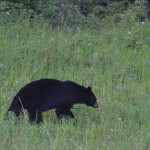 Next up on the critter list were black bears. I saw several working their way along the roadside grazing as they went. 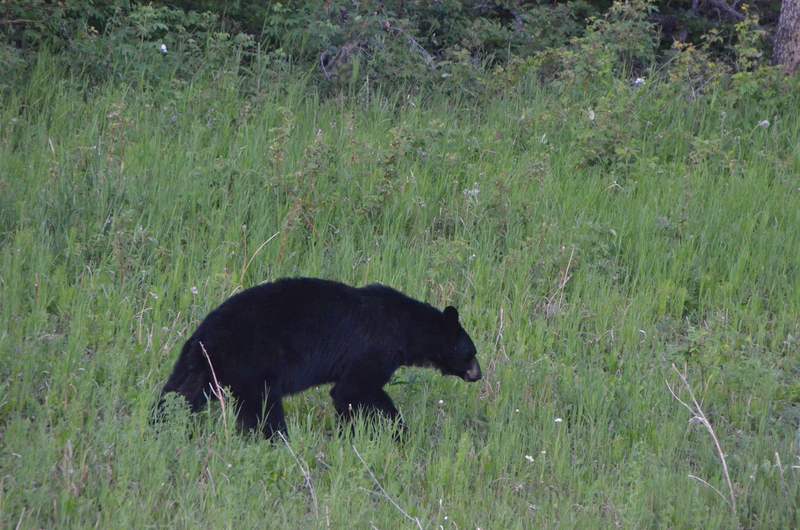 I understand this is typical behavior for young bears and coyotes newly on their own, seemingly a lot of scavenging opportunities and easy movement along the road. It also means they are more likely to cross the road and get hit by traffic, so keep an eye on them as you approach. The next herd of bison I spotted was in a long straight stretch. It was a larger group, the space along the road here was wider as well. As before there were several calves. This time I got some much better pictures as it was a simpler matter to be outside the car with a camera. I also took a couple of close ups snaps out of the open passenger window as I drove past. 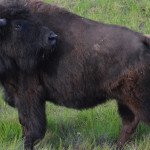 Little did I know that I would be nearly sick of bison by the time I spent a week in Yellowstone and several days in the Black Hills. 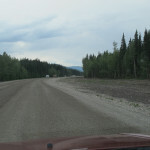 The road crosses back and forth between British Columbia and Yukon Territory several times as it approaches Watson Lake heading west. The end of this day was in Watson Lake, which is in Yukon Territory. I arrived pretty late in Watson lake and most everything was closed. But being this far north it was still quite daylight at ten o’clock. I have to say this made the driving very pleasant. From a pullout near steamboat summit. Watching the rain a valley away. Looking up the valley above Muncho lake. River channels weaving back and forth in the gravel. The settlement ahead is a guest ranch. This apparently is meant to be a horse. Little enough traffic and straight enough road to stop and get a photo. For the more artful shots, I pulled over. Of course I’ve “herd” of bison. Welcome to Yukon, unfortunately it seemed these guys weren’t open. Historical Milepost, at the official Yukon border.